"Ibn Sīnā" redirects here. For the mountain peak, see Lenin Peak. Ibn Sina (Persian: ابن سینا‎), also known as Abu Ali Sina (ابوعلیِ سینا), Pur Sina (پورسینا), and often known in the west as Avicenna (c. 980 – June 1037) was a Persian polymath who is regarded as one of the most significant physicians, astronomers, thinkers and writers of the Islamic Golden Age. He has been described as the father of early modern medicine. Of the 450 works he is known to have written, around 240 have survived, including 150 on philosophy and 40 on medicine. His most famous works are The Book of Healing, a philosophical and scientific encyclopedia, and The Canon of Medicine, a medical encyclopedia which became a standard medical text at many medieval universities and remained in use as late as 1650. In 1973, Avicenna's Canon Of Medicine was reprinted in New York. Besides philosophy and medicine, Avicenna's corpus includes writings on astronomy, alchemy, geography and geology, psychology, Islamic theology, logic, mathematics, physics and works of poetry. Avicenna is a Latin corruption of the Arabic patronym ibn Sīnā (ابن سينا‎), meaning "Son of Sina". However, Avicenna was not the son but the great-great-grandson of a man named Sina. His formal Arabic name was Abū ʿAlī al-Ḥusayn ibn ʿAbdillāh ibn al-Ḥasan ibn ʿAlī ibn Sīnā (أبو علي الحسين بن عبد الله بن الحسن بن علي بن سينا). Ibn Sina created an extensive corpus of works during what is commonly known as the Islamic Golden Age, in which the translations of Greco-Roman, Persian, and Indian texts were studied extensively. Greco-Roman (Mid- and Neo-Platonic, and Aristotelian) texts translated by the Kindi school were commented, redacted and developed substantially by Islamic intellectuals, who also built upon Persian and Indian mathematical systems, astronomy, algebra, trigonometry and medicine. The Samanid dynasty in the eastern part of Persia, Greater Khorasan and Central Asia as well as the Buyid dynasty in the western part of Persia and Iraq provided a thriving atmosphere for scholarly and cultural development. Under the Samanids, Bukhara rivaled Baghdad as a cultural capital of the Islamic world. The study of the Quran and the Hadith thrived in such a scholarly atmosphere. Philosophy, Fiqh and theology (kalaam) were further developed, most noticeably by Avicenna and his opponents. Al-Razi and Al-Farabi had provided methodology and knowledge in medicine and philosophy. Avicenna had access to the great libraries of Balkh, Khwarezm, Gorgan, Rey, Isfahan and Hamadan. Various texts (such as the 'Ahd with Bahmanyar) show that he debated philosophical points with the greatest scholars of the time. Aruzi Samarqandi describes how before Avicenna left Khwarezm he had met Al-Biruni (a famous scientist and astronomer), Abu Nasr Iraqi (a renowned mathematician), Abu Sahl Masihi (a respected philosopher) and Abu al-Khayr Khammar (a great physician). 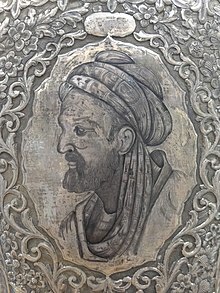 Avicenna was born c. 980 in Afshana, a village near Bukhara (in present-day Uzbekistan), the capital of the Samanids, a Persian dynasty in Central Asia and Greater Khorasan. His mother, named Sitāra, was from Bukhara; his father, Abdullāh, was a respected Ismaili scholar from Balkh, an important town of the Samanid Empire, in what is today Balkh Province, Afghanistan. His father worked in the government of Samanid in the village Kharmasain, a Sunni regional power. After five years, his younger brother, Mahmoud, was born. Avicenna first began to learn the Quran and literature in such a way that when he was ten years old he had essentially learned all of them. According to his autobiography, Avicenna had memorised the entire Quran by the age of 10. He learned Indian arithmetic from an Indian greengrocer, Mahmoud Massahi and he began to learn more from a wandering scholar who gained a livelihood by curing the sick and teaching the young. He also studied Fiqh (Islamic jurisprudence) under the Sunni Hanafi scholar Ismail al-Zahid. Avicenna was taught some extent of philosophy books such as Introduction (Isagoge)'s Porphyry (philosopher), Euclid's Elements, Ptolemy's Almagest by an unpopular philosopher, Abu Abdullah Nateli, who claimed philosophizing. As a teenager, he was greatly troubled by the Metaphysics of Aristotle, which he could not understand until he read al-Farabi's commentary on the work. For the next year and a half, he studied philosophy, in which he encountered greater obstacles. In such moments of baffled inquiry, he would leave his books, perform the requisite ablutions, then go to the mosque, and continue in prayer till light broke on his difficulties. Deep into the night, he would continue his studies, and even in his dreams problems would pursue him and work out their solution. Forty times, it is said, he read through the Metaphysics of Aristotle, till the words were imprinted on his memory; but their meaning was hopelessly obscure, until one day they found illumination, from the little commentary by Farabi, which he bought at a bookstall for the small sum of three dirhams. So great was his joy at the discovery, made with the help of a work from which he had expected only mystery, that he hastened to return thanks to God, and bestowed alms upon the poor. He turned to medicine at 16, and not only learned medical theory, but also by gratuitous attendance of the sick had, according to his own account, discovered new methods of treatment. The teenager achieved full status as a qualified physician at age 18, and found that "Medicine is no hard and thorny science, like mathematics and metaphysics, so I soon made great progress; I became an excellent doctor and began to treat patients, using approved remedies." The youthful physician's fame spread quickly, and he treated many patients without asking for payment. A number of theories have been proposed regarding Avicenna's madhab (school of thought within Islamic jurisprudence). Medieval historian Ẓahīr al-dīn al-Bayhaqī (d. 1169) considered Avicenna to be a follower of the Brethren of Purity. On the other hand, Dimitri Gutas along with Aisha Khan and Jules J. Janssens demonstrated that Avicenna was a Sunni Hanafi. However, the 14th century Shia faqih Nurullah Shushtari according to Seyyed Hossein Nasr, maintained that he was most likely a Twelver Shia. Conversely, Sharaf Khorasani, citing a rejection of an invitation of the Sunni Governor Sultan Mahmoud Ghazanavi by Avicenna to his court, believes that Avicenna was an Ismaili. Similar disagreements exist on the background of Avicenna's family, whereas some writers considered them Sunni, some more recent writers contested that they were Shia. Avicenna's first appointment was that of physician to the emir, Nuh II, who owed him his recovery from a dangerous illness (997). Ibn Sina's chief reward for this service was access to the royal library of the Samanids, well-known patrons of scholarship and scholars. When the library was destroyed by fire not long after, the enemies of Ibn Sina accused him of burning it, in order for ever to conceal the sources of his knowledge. Meanwhile, he assisted his father in his financial labors, but still found time to write some of his earliest works. At 22 years old, Avicenna lost his father. The Samanid dynasty came to its end in December 1004. Avicenna seems to have declined the offers of Mahmud of Ghazni, and proceeded westwards to Urgench in modern Turkmenistan, where the vizier, regarded as a friend of scholars, gave him a small monthly stipend. The pay was small, however, so Ibn Sina wandered from place to place through the districts of Nishapur and Merv to the borders of Khorasan, seeking an opening for his talents. Qabus, the generous ruler of Tabaristan, himself a poet and a scholar, with whom Ibn Sina had expected to find asylum, was on about that date (1012) starved to death by his troops who had revolted. Avicenna himself was at this time stricken by a severe illness. Finally, at Gorgan, near the Caspian Sea, Avicenna met with a friend, who bought a dwelling near his own house in which Avicenna lectured on logic and astronomy. Several of his treatises were written for this patron; and the commencement of his Canon of Medicine also dates from his stay in Hyrcania. Avicenna subsequently settled at Rey, in the vicinity of modern Tehran, the home town of Rhazes; where Majd Addaula, a son of the last Buwayhid emir, was nominal ruler under the regency of his mother (Seyyedeh Khatun). About thirty of Ibn Sina's shorter works are said to have been composed in Rey. Constant feuds which raged between the regent and her second son, Shams al-Daula, however, compelled the scholar to quit the place. After a brief sojourn at Qazvin he passed southwards to Hamadãn where Shams al-Daula, another Buwayhid emir, had established himself. At first, Ibn Sina entered into the service of a high-born lady; but the emir, hearing of his arrival, called him in as medical attendant, and sent him back with presents to his dwelling. Ibn Sina was even raised to the office of vizier. The emir decreed that he should be banished from the country. Ibn Sina, however, remained hidden for forty days in sheikh Ahmed Fadhel's house, until a fresh attack of illness induced the emir to restore him to his post. Even during this perturbed time, Ibn Sina persevered with his studies and teaching. Every evening, extracts from his great works, the Canon and the Sanatio, were dictated and explained to his pupils. On the death of the emir, Ibn Sina ceased to be vizier and hid himself in the house of an apothecary, where, with intense assiduity, he continued the composition of his works. Meanwhile, he had written to Abu Ya'far, the prefect of the dynamic city of Isfahan, offering his services. The new emir of Hamadan, hearing of this correspondence and discovering where Ibn Sina was hiding, incarcerated him in a fortress. War meanwhile continued between the rulers of Isfahan and Hamadãn; in 1024 the former captured Hamadan and its towns, expelling the Tajik mercenaries. When the storm had passed, Ibn Sina returned with the emir to Hamadan, and carried on his literary labors. Later, however, accompanied by his brother, a favorite pupil, and two slaves, Ibn Sina escaped from the city in the dress of a Sufi ascetic. After a perilous journey, they reached Isfahan, receiving an honorable welcome from the prince. The remaining ten or twelve years of Ibn Sīnā's life were spent in the service of the Kakuyid ruler Muhammad ibn Rustam Dushmanziyar (also known as Ala al-Dawla), whom he accompanied as physician and general literary and scientific adviser, even in his numerous campaigns. During these years he began to study literary matters and philology, instigated, it is asserted, by criticisms on his style. A severe colic, which seized him on the march of the army against Hamadan, was checked by remedies so violent that Ibn Sina could scarcely stand. On a similar occasion the disease returned; with difficulty he reached Hamadan, where, finding the disease gaining ground, he refused to keep up the regimen imposed, and resigned himself to his fate. His friends advised him to slow down and take life moderately. He refused, however, stating that: "I prefer a short life with width to a narrow one with length". On his deathbed remorse seized him; he bestowed his goods on the poor, restored unjust gains, freed his slaves, and read through the Quran every three days until his death. He died in June 1037, in his fifty-eighth year, in the month of Ramadan and was buried in Hamadan, Iran. Ibn Sīnā wrote extensively on early Islamic philosophy, especially the subjects logic, ethics, and metaphysics, including treatises named Logic and Metaphysics. Most of his works were written in Arabic – then the language of science in the Middle East – and some in Persian. Of linguistic significance even to this day are a few books that he wrote in nearly pure Persian language (particularly the Danishnamah-yi 'Ala', Philosophy for Ala' ad-Dawla'). Ibn Sīnā's commentaries on Aristotle often criticized the philosopher, encouraging a lively debate in the spirit of ijtihad. Avicenna's Neoplatonic scheme of "emanations" became fundamental in the Kalam (school of theological discourse) in the 12th century. His Book of Healing became available in Europe in partial Latin translation some fifty years after its composition, under the title Sufficientia, and some authors have identified a "Latin Avicennism" as flourishing for some time, paralleling the more influential Latin Averroism, but suppressed by the Parisian decrees of 1210 and 1215. Avicenna's psychology and theory of knowledge influenced William of Auvergne, Bishop of Paris and Albertus Magnus, while his metaphysics influenced the thought of Thomas Aquinas. Early Islamic philosophy and Islamic metaphysics, imbued as it is with Islamic theology, distinguishes more clearly than Aristotelianism between essence and existence. Whereas existence is the domain of the contingent and the accidental, essence endures within a being beyond the accidental. The philosophy of Ibn Sīnā, particularly that part relating to metaphysics, owes much to al-Farabi. The search for a definitive Islamic philosophy separate from Occasionalism can be seen in what is left of his work. Following al-Farabi's lead, Avicenna initiated a full-fledged inquiry into the question of being, in which he distinguished between essence (Mahiat) and existence (Wujud). He argued that the fact of existence cannot be inferred from or accounted for by the essence of existing things, and that form and matter by themselves cannot interact and originate the movement of the universe or the progressive actualization of existing things. Existence must, therefore, be due to an agent-cause that necessitates, imparts, gives, or adds existence to an essence. To do so, the cause must be an existing thing and coexist with its effect. Avicenna's consideration of the essence-attributes question may be elucidated in terms of his ontological analysis of the modalities of being; namely impossibility, contingency, and necessity. Avicenna argued that the impossible being is that which cannot exist, while the contingent in itself (mumkin bi-dhatihi) has the potentiality to be or not to be without entailing a contradiction. When actualized, the contingent becomes a 'necessary existent due to what is other than itself' (wajib al-wujud bi-ghayrihi). Thus, contingency-in-itself is potential beingness that could eventually be actualized by an external cause other than itself. The metaphysical structures of necessity and contingency are different. Necessary being due to itself (wajib al-wujud bi-dhatihi) is true in itself, while the contingent being is 'false in itself' and 'true due to something else other than itself'. The necessary is the source of its own being without borrowed existence. It is what always exists. The Necessary exists 'due-to-Its-Self', and has no quiddity/essence (mahiyya) other than existence (wujud). Furthermore, It is 'One' (wahid ahad) since there cannot be more than one 'Necessary-Existent-due-to-Itself' without differentia (fasl) to distinguish them from each other. Yet, to require differentia entails that they exist 'due-to-themselves' as well as 'due to what is other than themselves'; and this is contradictory. However, if no differentia distinguishes them from each other, then there is no sense in which these 'Existents' are not one and the same. Avicenna adds that the 'Necessary-Existent-due-to-Itself' has no genus (jins), nor a definition (hadd), nor a counterpart (nadd), nor an opposite (did), and is detached (bari) from matter (madda), quality (kayf), quantity (kam), place (ayn), situation (wad), and time (waqt). Avicenna's theology on metaphysical issues (ilāhiyyāt) has been criticized by some Islamic scholars, among them al-Ghazali, Ibn Taymiyya, and Ibn al-Qayyim. [page needed] While discussing the views of the theists among the Greek philosophers, namely Socrates, Plato, and Aristotle in Al-Munqidh min ad-Dalal ("Deliverance from Error"), al-Ghazali noted that the Greek philosophers "must be taxed with unbelief, as must their partisans among the Muslim philosophers, such as Ibn Sina and al-Farabi and their likes." He added that "None, however, of the Muslim philosophers engaged so much in transmitting Aristotle's lore as did the two men just mentioned. [...] The sum of what we regard as the authentic philosophy of Aristotle, as transmitted by al-Farabi and Ibn Sina, can be reduced to three parts: a part which must be branded as unbelief; a part which must be stigmatized as innovation; and a part which need not be repudiated at all. Avicenna made an argument for the existence of God which would be known as the "Proof of the Truthful" (Arabic: al-burhan al-siddiqin). Avicenna argued that there must be a "necessary existent" (Arabic: wajib al-wujud), an entity that cannot not exist and through a series of arguments, he identified it with the Islamic conception of God. Present-day historian of philosophy Peter Adamson called this argument one of the most influential medieval arguments for God's existence, and Avicenna's biggest contribution to the history of philosophy. Correspondence between Ibn Sina (with his student Ahmad ibn 'Ali al-Ma'sumi) and Al-Biruni has survived in which they debated Aristotelian natural philosophy and the Peripatetic school. Abu Rayhan began by asking Avicenna eighteen questions, ten of which were criticisms of Aristotle's On the Heavens. Avicenna was a devout Muslim and sought to reconcile rational philosophy with Islamic theology. His aim was to prove the existence of God and His creation of the world scientifically and through reason and logic. Avicenna's views on Islamic theology (and philosophy) were enormously influential, forming part of the core of the curriculum at Islamic religious schools until the 19th century. Avicenna wrote a number of short treatises dealing with Islamic theology. These included treatises on the prophets (whom he viewed as "inspired philosophers"), and also on various scientific and philosophical interpretations of the Quran, such as how Quranic cosmology corresponds to his own philosophical system. In general these treatises linked his philosophical writings to Islamic religious ideas; for example, the body's afterlife. There are occasional brief hints and allusions in his longer works however that Avicenna considered philosophy as the only sensible way to distinguish real prophecy from illusion. He did not state this more clearly because of the political implications of such a theory, if prophecy could be questioned, and also because most of the time he was writing shorter works which concentrated on explaining his theories on philosophy and theology clearly, without digressing to consider epistemological matters which could only be properly considered by other philosophers. Later interpretations of Avicenna's philosophy split into three different schools; those (such as al-Tusi) who continued to apply his philosophy as a system to interpret later political events and scientific advances; those (such as al-Razi) who considered Avicenna's theological works in isolation from his wider philosophical concerns; and those (such as al-Ghazali) who selectively used parts of his philosophy to support their own attempts to gain greater spiritual insights through a variety of mystical means. It was the theological interpretation championed by those such as al-Razi which eventually came to predominate in the madrasahs. Avicenna memorized the Quran by the age of ten, and as an adult, he wrote five treatises commenting on suras from the Quran. One of these texts included the Proof of Prophecies, in which he comments on several Quranic verses and holds the Quran in high esteem. Avicenna argued that the Islamic prophets should be considered higher than philosophers. One of us (i.e. a human being) should be imagined as having been created in a single stroke; created perfect and complete but with his vision obscured so that he cannot perceive external entities; created falling through air or a void, in such a manner that he is not struck by the firmness of the air in any way that compels him to feel it, and with his limbs separated so that they do not come in contact with or touch each other. Then contemplate the following: can he be assured of the existence of himself? He does not have any doubt in that his self exists, without thereby asserting that he has any exterior limbs, nor any internal organs, neither heart nor brain, nor any one of the exterior things at all; but rather he can affirm the existence of himself, without thereby asserting there that this self has any extension in space. Even if it were possible for him in that state to imagine a hand or any other limb, he would not imagine it as being a part of his self, nor as a condition for the existence of that self; for as you know that which is asserted is different from that which is not asserted and that which is inferred is different from that which is not inferred. Therefore the self, the existence of which has been asserted, is a unique characteristic, in as much that it is not as such the same as the body or the limbs, which have not been ascertained. Thus that which is ascertained (i.e. the self), does have a way of being sure of the existence of the soul as something other than the body, even something non-bodily; this he knows, this he should understand intuitively, if it is that he is ignorant of it and needs to be beaten with a stick [to realize it]. However, Avicenna posited the brain as the place where reason interacts with sensation. Sensation prepares the soul to receive rational concepts from the universal Agent Intellect. The first knowledge of the flying person would be "I am," affirming his or her essence. That essence could not be the body, obviously, as the flying person has no sensation. Thus, the knowledge that "I am" is the core of a human being: the soul exists and is self-aware. Avicenna thus concluded that the idea of the self is not logically dependent on any physical thing, and that the soul should not be seen in relative terms, but as a primary given, a substance. The body is unnecessary; in relation to it, the soul is its perfection. In itself, the soul is an immaterial substance. 12th-century manuscript of the Canon, kept at the Azerbaijan National Academy of Sciences. Avicenna considered whether events like rare diseases or disorders have natural causes. He used the example of polydactyly to explain his perception that causal reasons exist for all medical events. This view of medical phenomena anticipated developments in the Enlightenment by seven centuries. Either they are the effects of upheavals of the crust of the earth, such as might occur during a violent earthquake, or they are the effect of water, which, cutting itself a new route, has denuded the valleys, the strata being of different kinds, some soft, some hard ... It would require a long period of time for all such changes to be accomplished, during which the mountains themselves might be somewhat diminished in size. In the Al-Burhan (On Demonstration) section of The Book of Healing, Avicenna discussed the philosophy of science and described an early scientific method of inquiry. He discusses Aristotle's Posterior Analytics and significantly diverged from it on several points. Avicenna discussed the issue of a proper methodology for scientific inquiry and the question of "How does one acquire the first principles of a science?" He asked how a scientist would arrive at "the initial axioms or hypotheses of a deductive science without inferring them from some more basic premises?" He explains that the ideal situation is when one grasps that a "relation holds between the terms, which would allow for absolute, universal certainty". Avicenna then adds two further methods for arriving at the first principles: the ancient Aristotelian method of induction (istiqra), and the method of examination and experimentation (tajriba). Avicenna criticized Aristotelian induction, arguing that "it does not lead to the absolute, universal, and certain premises that it purports to provide." In its place, he develops a "method of experimentation as a means for scientific inquiry." An early formal system of temporal logic was studied by Avicenna. Although he did not develop a real theory of temporal propositions, he did study the relationship between temporalis and the implication. Avicenna's work was further developed by Najm al-Dīn al-Qazwīnī al-Kātibī and became the dominant system of Islamic logic until modern times. Avicennian logic also influenced several early European logicians such as Albertus Magnus and William of Ockham. Avicenna endorsed the law of noncontradiction proposed by Aristotle, that a fact could not be both true and false at the same time and in the same sense of the terminology used. He stated, "Anyone who denies the law of noncontradiction should be beaten and burned until he admits that to be beaten is not the same as not to be beaten, and to be burned is not the same as not to be burned." In mechanics, Ibn Sīnā, in The Book of Healing, developed a theory of motion, in which he made a distinction between the inclination (tendency to motion) and force of a projectile, and concluded that motion was a result of an inclination (mayl) transferred to the projectile by the thrower, and that projectile motion in a vacuum would not cease. He viewed inclination as a permanent force whose effect is dissipated by external forces such as air resistance. The theory of motion presented by Avicenna was probably influenced by the 6th-century Alexandrian scholar John Philoponus. Avicenna's is a less sophisticated variant of the theory of impetus developed by Buridan in the 14th century. It is unclear if Buridan was influenced by Avicenna, or by Philoponus directly. Independent observation had demonstrated to him that the bow is not formed in the dark cloud but rather in the very thin mist lying between the cloud and the sun or observer. The cloud, he thought, serves simply as the background of this thin substance, much as a quicksilver lining is placed upon the rear surface of the glass in a mirror. Ibn Sīnā would change the place not only of the bow, but also of the color formation, holding the iridescence to be merely a subjective sensation in the eye. Avicenna says in his book of heaven and earth, that heat is generated from motion in external things. Avicenna's legacy in classical psychology is primarily embodied in the Kitab al-nafs parts of his Kitab al-shifa (The Book of Healing) and Kitab al-najat (The Book of Deliverance). These were known in Latin under the title De Anima (treatises "on the soul"). [dubious – discuss] Notably, Avicenna develops what is called the "flying man" argument in the Psychology of The Cure I.1.7 as defense of the argument that the soul is without quantitative extension, which has an affinity with Descartes's cogito argument (or what phenomenology designates as a form of an "epoche"). Avicenna's psychology requires that connection between the body and soul be strong enough to ensure the soul's individuation, but weak enough to allow for its immortality. Avicenna grounds his psychology on physiology, which means his account of the soul is one that deals almost entirely with the natural science of the body and its abilities of perception. Thus, the philosopher's connection between the soul and body is explained almost entirely by his understanding of perception; in this way, bodily perception interrelates with the immaterial human intellect. In sense perception, the perceiver senses the form of the object; first, by perceiving features of the object by our external senses. This sensory information is supplied to the internal senses, which merge all the pieces into a whole, unified conscious experience. This process of perception and abstraction is the nexus of the soul and body, for the material body may only perceive material objects, while the immaterial soul may only receive the immaterial, universal forms. The way the soul and body interact in the final abstraction of the universal from the concrete particular is the key to their relationship and interaction, which takes place in the physical body. The soul completes the action of intellection by accepting forms that have been abstracted from matter. This process requires a concrete particular (material) to be abstracted into the universal intelligible (immaterial). The material and immaterial interact through the Active Intellect, which is a "divine light" containing the intelligible forms. The Active Intellect reveals the universals concealed in material objects much like the sun makes color available to our eyes. Avicenna wrote an attack on astrology titled Resāla fī ebṭāl aḥkām al-nojūm, in which he cited passages from the Quran to dispute the power of astrology to foretell the future. He believed that each planet had some influence on the earth, but argued against astrologers being able to determine the exact effects. Avicenna's astronomical writings had some influence on later writers, although in general his work could be considered less developed than Alhazen or Al-Biruni. One important feature of his writing is that he considers mathematical astronomy as a separate discipline to astrology. He criticized Aristotle's view of the stars receiving their light from the Sun, stating that the stars are self-luminous, and believed that the planets are also self-luminous. He claimed to have observed Venus as a spot on the Sun. This is possible, as there was a transit on May 24, 1032, but Avicenna did not give the date of his observation, and modern scholars have questioned whether he could have observed the transit from his location at that time; he may have mistaken a sunspot for Venus. He used his transit observation to help establish that Venus was, at least sometimes, below the Sun in Ptolemaic cosmology, i.e. the sphere of Venus comes before the sphere of the Sun when moving out from the Earth in the prevailing geocentric model. He also wrote the Summary of the Almagest, (based on Ptolemy's Almagest), with an appended treatise "to bring that which is stated in the Almagest and what is understood from Natural Science into conformity". For example, Avicenna considers the motion of the solar apogee, which Ptolemy had taken to be fixed. Ibn Sīnā used steam distillation to produce essential oils such as rose essence, which he used as aromatherapeutic treatments for heart conditions. Those of the chemical craft know well that no change can be effected in the different species of substances, though they can produce the appearance of such change. Liber Aboali Abincine de Anima in arte Alchemiae was the most influential, having influenced later medieval chemists and alchemists such as Vincent of Beauvais. However Anawati argues (following Ruska) that the de Anima is a fake by a Spanish author. Similarly the Declaratio is believed not to be actually by Avicenna. The third work (The Book of Minerals) is agreed to be Avicenna's writing, adapted from the Kitab al-Shifa (Book of the Remedy). Ibn Sina classified minerals into stones, fusible substances, sulfurs, and salts, building on the ideas of Aristotle and Jabir. The epistola de Re recta is somewhat less sceptical of alchemy; Anawati argues that it is by Avicenna, but written earlier in his career when he had not yet firmly decided that transmutation was impossible. All the problems of the universe have been solved by me. As early as the 13th century when Dante Alighieri depicted him in Limbo alongside the virtuous non-Christian thinkers in his Divine Comedy such as Virgil, Averroes, Homer, Horace, Ovid, Lucan, Socrates, Plato, and Saladin. Avicenna has been recognized by both East and West, as one of the great figures in intellectual history. George Sarton, the author of The History of Science, described Ibn Sīnā as "one of the greatest thinkers and medical scholars in history" and called him "the most famous scientist of Islam and one of the most famous of all races, places, and times." He was one of the Islamic world's leading writers in the field of medicine. Along with Rhazes, Abulcasis, Ibn al-Nafis, and al-Ibadi, Ibn Sīnā is considered an important compiler of early Muslim medicine. He is remembered in the Western history of medicine as a major historical figure who made important contributions to medicine and the European Renaissance. His medical texts were unusual in that where controversy existed between Galen and Aristotle's views on medical matters (such as anatomy), he preferred to side with Aristotle, where necessary updating Aristotle's position to take into account post-Aristotelian advances in anatomical knowledge. Aristotle's dominant intellectual influence among medieval European scholars meant that Avicenna's linking of Galen's medical writings with Aristotle's philosophical writings in the Canon of Medicine (along with its comprehensive and logical organisation of knowledge) significantly increased Avicenna's importance in medieval Europe in comparison to other Islamic writers on medicine. His influence following translation of the Canon was such that from the early fourteenth to the mid-sixteenth centuries he was ranked with Hippocrates and Galen as one of the acknowledged authorities, princeps medicorum ("prince of physicians"). In present-day Iran, Afghanistan and Tajikistan, he is considered a national icon, and is often regarded as among the greatest Persians. A monument was erected outside the Bukhara museum[year needed]. The Avicenna Mausoleum and Museum in Hamadan was built in 1952. Bu-Ali Sina University in Hamadan (Iran), the biotechnology Avicenna Research Institute in Tehran (Iran), the ibn Sīnā Tajik State Medical University in Dushanbe, Ibn Sina Academy of Medieval Medicine and Sciences at Aligarh, India, Avicenna School in Karachi and Avicenna Medical College in Lahore, Pakistan, Ibne Sina Balkh Medical School in his native province of Balkh in Afghanistan, Ibni Sina Faculty Of Medicine of Ankara University Ankara, Turkey, the main classroom building (the Avicenna Building) of the Sharif University of Technology, and Ibn Sina Integrated School in Marawi City (Philippines) are all named in his honour. His portrait hangs in the Hall of the Avicenna Faculty of Medicine in the University of Paris. There is a crater on the Moon named Avicenna and a mangrove genus Avicennia. In 1980, the Soviet Union, which then ruled his birthplace Bukhara, celebrated the thousandth anniversary of Avicenna's birth by circulating various commemorative stamps with artistic illustrations, and by erecting a bust of Avicenna based on anthropological research by Soviet scholars. Near his birthplace in Qishlak Afshona, some 25 km (16 mi) north of Bukhara, a training college for medical staff has been named for him. [year needed] On the grounds is a museum dedicated to his life, times and work. The Avicenna Prize, established in 2003, is awarded every two years by UNESCO and rewards individuals and groups for their achievements in the field of ethics in science. The aim of the award is to promote ethical reflection on issues raised by advances in science and technology, and to raise global awareness of the importance of ethics in science. The Avicenna Directories (2008–15; now the World Directory of Medical Schools) list universities and schools where doctors, public health practitioners, pharmacists and others, are educated. The original project team stated "Why Avicenna? Avicenna ... was ... noted for his synthesis of knowledge from both east and west. He has had a lasting influence on the development of medicine and health sciences. The use of Avicenna's name symbolises the worldwide partnership that is needed for the promotion of health services of high quality." In June 2009, Iran donated a "Persian Scholars Pavilion" to United Nations Office in Vienna which is placed in the central Memorial Plaza of the Vienna International Center. 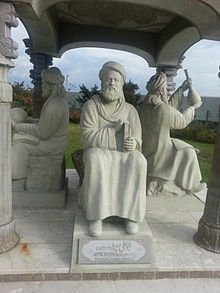 The "Persian Scholars Pavilion" at United Nations in Vienna, Austria is featuring the statues of four prominent Iranian figures. Highlighting the Iranian architectural features, the pavilion is adorned with Persian art forms and includes the statues of renowned Iranian scientists Avicenna, Al-Biruni, Zakariya Razi (Rhazes) and Omar Khayyam. The 1982 Soviet film Youth of Genius (Russian: Юность гения, translit. Yunost geniya) by Elyor Ishmukhamedov [ru] recounts Avicenna's younger years. The film is set in Bukhara at the turn of the millennium. In Louis L'Amour's 1985 historical novel The Walking Drum, Kerbouchard studies and discusses Avicenna's The Canon of Medicine. In his book The Physician (1988) Noah Gordon tells the story of a young English medical apprentice who disguises himself as a Jew to travel from England to Persia and learn from Avicenna, the great master of his time. The novel was adapted into a feature film, The Physician, in 2013. Avicenna was played by Ben Kingsley. The treatises of Ibn Sīnā influenced later Muslim thinkers in many areas including theology, philology, mathematics, astronomy, physics, and music. His works numbered almost 450 volumes on a wide range of subjects, of which around 240 have survived. In particular, 150 volumes of his surviving works concentrate on philosophy and 40 of them concentrate on medicine. His most famous works are The Book of Healing, and The Canon of Medicine. Ibn Sīnā wrote at least one treatise on alchemy, but several others have been falsely attributed to him. His Logic, Metaphysics, Physics, and De Caelo, are treatises giving a synoptic view of Aristotelian doctrine, though Metaphysics demonstrates a significant departure from the brand of Neoplatonism known as Aristotelianism in Ibn Sīnā's world; Arabic philosophers[who? ][year needed] have hinted at the idea that Ibn Sīnā was attempting to "re-Aristotelianise" Muslim philosophy in its entirety, unlike his predecessors, who accepted the conflation of Platonic, Aristotelian, Neo- and Middle-Platonic works transmitted into the Muslim world. The Logic and Metaphysics have been extensively reprinted, the latter, e.g., at Venice in 1493, 1495, and 1546. Some of his shorter essays on medicine, logic, etc., take a poetical form (the poem on logic was published by Schmoelders in 1836). Two encyclopaedic treatises, dealing with philosophy, are often mentioned. The larger, Al-Shifa' (Sanatio), exists nearly complete in manuscript in the Bodleian Library and elsewhere; part of it on the De Anima appeared at Pavia (1490) as the Liber Sextus Naturalium, and the long account of Ibn Sina's philosophy given by Muhammad al-Shahrastani seems to be mainly an analysis, and in many places a reproduction, of the Al-Shifa'. A shorter form of the work is known as the An-najat (Liberatio). The Latin editions of part of these works have been modified by the corrections which the monastic editors confess that they applied. There is also a حكمت مشرقيه‎ (hikmat-al-mashriqqiyya, in Latin Philosophia Orientalis), mentioned by Roger Bacon, the majority of which is lost in antiquity, which according to Averroes was pantheistic in tone. Al-isharat wa al-tanbihat (Remarks and Admonitions), ed. S. Dunya, Cairo, 1960; parts translated by S.C. Inati, Remarks and Admonitions, Part One: Logic, Toronto, Ont. : Pontifical Institute for Mediaeval Studies, 1984, and Ibn Sina and Mysticism, Remarks and Admonitions: Part 4, London: Kegan Paul International, 1996. Al-Qanun fi'l-tibb (The Canon of Medicine), ed. I. a-Qashsh, Cairo, 1987. (Encyclopedia of medicine.) manuscript, Latin translation, Flores Avicenne, Michael de Capella, 1508, Modern text. Ahmed Shawkat Al-Shatti, Jibran Jabbur. Risalah fi sirr al-qadar (Essay on the Secret of Destiny), trans. G. Hourani in Reason and Tradition in Islamic Ethics, Cambridge: Cambridge University Press, 1985. Danishnama-i 'ala'i (The Book of Scientific Knowledge), ed. and trans. P. Morewedge, The Metaphysics of Avicenna, London: Routledge and Kegan Paul, 1973. Kitab al-Shifa' (The Book of Healing). (Ibn Sina's major work on philosophy. He probably began to compose al-Shifa' in 1014, and completed it in 1020.) Critical editions of the Arabic text have been published in Cairo, 1952–83, originally under the supervision of I. Madkour. Hayy ibn Yaqdhan a Persian myth. A novel called Hayy ibn Yaqdhan, based on Avicenna's story, was later written by Ibn Tufail (Abubacer) in the 12th century and translated into Latin and English as Philosophus Autodidactus in the 17th and 18th centuries respectively. In the 13th century, Ibn al-Nafis wrote his own novel Fadil ibn Natiq, known as Theologus Autodidactus in the West, as a critical response to Hayy ibn Yaqdhan. Avicenna's most important Persian work is the Danishnama-i 'Alai (دانشنامه علائی, "the Book of Knowledge for [Prince] 'Ala ad-Daulah"). Avicenna created new scientific vocabulary that had not previously existed in Persian. The Danishnama covers such topics as logic, metaphysics, music theory and other sciences of his time. It has been translated into English by Parwiz Morewedge in 1977. The book is also important in respect to Persian scientific works. Andar Danesh-e Rag (اندر دانش رگ, "On the Science of the Pulse") contains nine chapters on the science of the pulse and is a condensed synopsis. Persian poetry from Ibn Sina is recorded in various manuscripts and later anthologies such as Nozhat al-Majales. ^ In Bukhara (19 years) then Gurgānj, Khwārazm (13 years). ^ In Ray (1 year), Hamadān (9 years) and Isfahān (13 years). "D. Gutas, 1987, Avicenna ii. Biography, Encyclopædia Iranica". Iranicaonline.org. Retrieved 2012-01-07. ^ "Avicenna and the Visionary Recital". Princeton University Press. Retrieved 2018-08-12. In this work a distinguished scholar of Islamic religion examines the mysticism and psychological thought of the great eleventh-century Persian philosopher and physician Avicenna (Ibn Sina), author of over a hundred works on theology, logic, medicine, and mathematics. ^ Daly, Jonathan (2013-12-19). The Rise of Western Power: A Comparative History of Western Civilization. A&C Black. p. 18. ISBN 978-1-4411-1851-6. ^ * Bennison, Amira K. (2009). The great caliphs: the golden age of the 'Abbasid Empire. New Haven: Yale University Press. p. 195. ISBN 978-0-300-15227-2. Avicenna was a Persian whose father served the Samanids of Khurasan and Transoxania as the administrator of a rural district outside Bukhara. Paul Strathern (2005). A brief history of medicine: from Hippocrates to gene therapy. Running Press. p. 58. ISBN 978-0-7867-1525-1. .
Brian Duignan (2010). Medieval Philosophy. The Rosen Publishing Group. p. 89. ISBN 978-1-61530-244-4. .
Michael Kort (2004). Central Asian republics. Infobase Publishing. p. 24. ISBN 978-0-8160-5074-1. "He was born in 370/980 in Afshana, his mother's home, near Bukhara. His native language was Persian" (from "Ibn Sina ("Avicenna")", Encyclopedia of Islam, Brill, second edition (2009). Accessed via Brill Online at www.encislam.brill.nl). "Avicenna was the greatest of all Persian thinkers; as physician and metaphysician ..." (excerpt from A.J. Arberry, Avicenna on Theology, KAZI PUBN INC, 1995). "Whereas the name of Avicenna (Ibn Sina, died 1037) is generally listed as chronologically first among noteworthy Iranian philosophers, recent evidence has revealed previous existence of Ismaili philosophical systems with a structure no less complete than of Avicenna" (from p. 74 of Henry Corbin, The Voyage and the messenger: Iran and philosophy, North Atlantic Books, 1998. ^ Keyhani, Ali; Torkaman, Samira (2017-12-28). Ibn Sina (1st ed.). CreateSpace Independent Publishing Platform. ISBN 978-1-9842-9641-2. Ibn Sina is called the father of modern medicine for establishing a clinical practice. ^ Saffari, Mohsen; Pakpour, Amir (2012-12-01). "Avicenna's Canon of Medicine: A Look at Health, Public Health, and Environmental Sanitation". Archives of Iranian medicine. 15: 785–9. Avicenna was a well-known Persian and a Muslim scientist who was considered to be the father of early modern medicine. ^ Colgan, Richard (2009-09-19). Advice to the Young Physician: On the Art of Medicine. Springer Science & Business Media. p. 33. ISBN 978-1-4419-1034-9. Avicenna is known as the father of early modern medicine. ^ a b O'Connor, John J.; Robertson, Edmund F., "Avicenna", MacTutor History of Mathematics archive, University of St Andrews . ^ Nasr, Seyyed Hossein (2007). "Avicenna". Encyclopædia Britannica Online. Archived from the original on 31 October 2007. Retrieved 2007-11-05. ^ Edwin Clarke, Charles Donald O'Malley (1996), The human brain and spinal cord: a historical study illustrated by writings from antiquity to the twentieth century, Norman Publishing, p. 20 (ISBN 0-930405-25-0). ^ Iris Bruijn (2009), Ship's Surgeons of the Dutch East India Company: Commerce and the progress of medicine in the eighteenth century, Amsterdam University Press, p. 26 (ISBN 90-8728-051-3). ^ "Avicenna 980–1037". Hcs.osu.edu. Archived from the original on October 7, 2008. Retrieved 2010-01-19. ^ e.g. at the universities of Montpellier and Leuven (see "Medicine: an exhibition of books relating to medicine and surgery from the collection formed by J.K. Lilly". Indiana.edu. Archived from the original on 14 December 2009. Retrieved 2010-01-19. ). ^ Cibeles Jolivette Gonzalez. "Avicenna's Canon Of Medicine" – via Internet Archive. ^ "Avicenna", in Encyclopædia Iranica, Online Version 2006". Iranica.com. Retrieved 2010-01-19. ^ Byrne, Joseph Patrick (2012), "Avicenna", Encyclopedia of the Black Death, Vol. I, Santa Barbara, CA: ABC-CLIO, ISBN 978-1-59884-253-1 . ^ "Major periods of Muslim education and learning". Encyclopædia Britannica Online. 2007. Archived from the original on 12 December 2007. Retrieved 2007-12-16. ^ Afary, Janet (2007). "Iran". Encyclopædia Britannica Online. Retrieved 2007-12-16. ^ a b Corbin, Henry (1993) [First published French 1964)]. History of Islamic Philosophy, Translated by Liadain Sherrard, Philip Sherrard. London: Kegan Paul International in association with Islamic Publications for The Institute of Ismaili Studies. pp. 167–175. ISBN 978-0-7103-0416-2. OCLC 22109949. ^ a b c Aisha Khan (2006). Avicenna (Ibn Sina): Muslim physician and philosopher of the eleventh century. The Rosen Publishing Group. p. 38. ISBN 978-1-4042-0509-3. ^ a b "The Canon of Medicine (work by Avicenna)". Encyclopædia Britannica. 2008. Archived from the original on 28 May 2008. Retrieved 2008-06-11. ^ Jorge J.E. Gracia and Timothy B. Noone (2003), A Companion to Philosophy in the Middle Ages, p. 196, Blackwell Publishing, ISBN 0-631-21673-1. One or more of the preceding sentences incorporates text from a publication now in the public domain: Chisholm, Hugh, ed. (1911). "Avicenna" . Encyclopædia Britannica. 3 (11th ed.). Cambridge University Press. pp. 62–63. ^ a b Janssens, Jules L. (1991). An annotated bibliography on Ibn Sînâ (1970–1989): including Arabic and Persian publications and Turkish and Russian references. Leuven University Press. pp. 89–90. ISBN 978-90-6186-476-9. excerpt: "... [Dimitri Gutas's Avicenna's maḏhab convincingly demonstrates that I.S. was a sunnî-Ḥanafî." ^ Aisha Khan (2006-01-15). Avicenna (Ibn Sina): Muslim Physician And Philosopher of the Eleventh Century. The Rosen Publishing Group. p. 85. ISBN 978-1-4042-0509-3. ^ a b Osler, William (2004). The Evolution Of Modern Medicine. Kessinger Publishing. p. 72. ISBN 978-1-4191-6153-7. ^ c.f. e.g. Henry Corbin, History of Islamic Philosophy, Routledge, 2014, p. 174. Henry Corbin, Avicenna and the Visionary Recital, Princeton University Press, 2014, p. 103. ^ a b c "The Internet Encyclopedia of Philosophy, Avicenna (Ibn Sina) (c. 980–1037)". Iep.utm.edu. 2006-01-06. Retrieved 2010-01-19. ^ "Islam". Encyclopædia Britannica Online. 2007. Archived from the original on 22 December 2007. Retrieved 2007-11-27. ^ Avicenna, Metaphysica of Avicenna, trans. Parviz Morewedge (New York, 1973), p. 43. ^ Ibn al-Qayyim, Eghaathat al-Lahfaan, Published: Al Ashqar University (2003) Printed by International Islamic Publishing House: Riyadh. ^ Ibn Muḥammad al-Ghazālī, Abū Ḥāmid Muḥammad (1980). al-Munqidh min al-Dalal (PDF). Boston: American University of Beirut. p. 10. Archived from the original (PDF) on 2016-03-04. ^ a b Adamson, Peter (2013-07-04). "From the necessary existent to God". In Adamson, Peter (ed.). Interpreting Avicenna: Critical Essays. Cambridge University Press. p. 170. ISBN 978-0-521-19073-2. ^ Adamson, Peter (2013-07-04). "From the necessary existent to God". In Adamson, Peter (ed.). Interpreting Avicenna: Critical Essays. Cambridge University Press. p. 171. ISBN 978-0-521-19073-2. ^ Rafik Berjak and Muzaffar Iqbal, "Ibn Sina—Al-Biruni correspondence", Islam & Science, June 2003. ^ Lenn Evan Goodman (2003), Islamic Humanism, pp. 8–9, Oxford University Press, ISBN 0-19-513580-6. ^ James W. Morris (1992), "The Philosopher-Prophet in Avicenna's Political Philosophy", in C. Butterworth (ed. ), The Political Aspects of Islamic Philosophy, ISBN 978-0-932885-07-4, Chapter 4, Cambridge Harvard University Press, pp. 152–198 [p. 156]. ^ James W. Morris (1992), "The Philosopher-Prophet in Avicenna's Political Philosophy", in C. Butterworth (ed. ), The Political Aspects of Islamic Philosophy, Chapter 4, Cambridge Harvard University Press, pp. 152–198 [pp. 160–161]. ^ James W. Morris (1992), "The Philosopher-Prophet in Avicenna's Political Philosophy", in C. Butterworth (ed. ), The Political Aspects of Islamic Philosophy, Chapter 4, Cambridge Harvard University Press, pp. 152–198 [pp. 156–158]. ^ Jules Janssens (2004), "Avicenna and the Qur'an: A Survey of his Qur'anic commentaries", MIDEO 25, p. 177–192. يجب أن يتوهم الواحد منا كأنه خلق دفعةً وخلق كاملاً لكنه حجب بصره عن مشاهدة الخارجات وخلق يهوى في هواء أو خلاء هوياً لا يصدمه فيه قوام الهواء صدماً ما يحوج إلى أن يحس وفرق بين أعضائه فلم تتلاق ولم تتماس ثم يتأمل هل أنه يثبت وجود ذاته ولا يشكك في إثباته لذاته موجوداً ولا يثبت مع ذلك طرفاً من أعضائه ولا باطناً من أحشائه ولا قلباً ولا دماغاً ولا شيئاً من الأشياء من خارج بل كان يثبت ذاته ولا يثبت لها طولاً ولا عرضاً ولا عمقاً ولو أنه أمكنه في تلك الحالة أن يتخيل يداً أو عضواً آخر لم يتخيله جزء من ذاته ولا شرطاً في ذاته وأنت تعلم أن المثبت غير الذي لم يثبت والمقربه غير الذي لم يقربه فإذن للذات التي أثبت وجودها خاصية على أنها هو بعينه غير جسمه وأعضائه التي لم تثبت فإذن المثبت له سبيل إلى أن يثبته على وجود النفس شيئاً غير الجسم بل غير جسم وأنه عارف به مستشعر له وإن كان ذاهلاً عنه يحتاج إلى أن يقرع عصاه. ^ Hasse, Dag Nikolaus (2000). Avicenna's De Anima in the Latin West. London: Warburg Institute. p. 81. ^ a b Nader El-Bizri, The Phenomenological Quest between Avicenna and Heidegger (Binghamton, NY: Global Publications SUNY, 2000), pp. 149–171. ^ a b Nader El-Bizri, "Avicenna's De Anima between Aristotle and Husserl," in The Passions of the Soul in the Metamorphosis of Becoming, ed. Anna-Teresa Tymieniecka (Dordrecht: Kluwer Academic Publishers, 2003), pp. 67–89. ^ Nasr, Seyyed Hossein; Oliver Leaman (1996). History of Islamic philosophy. Routledge. pp. 315, 1022–1023. ISBN 978-0-415-05667-0. ^ Hasse, Dag Nikolaus (2000). Avicenna's De Anima in the Latin West. London: Warburg Institute. p. 92. ^ McGinnis, Jon (2010). Avicenna. Oxford: Oxford University Press. p. 227. ISBN 978-0-19-533147-9. ^ A.C. Brown, Jonathan (2014). Misquoting Muhammad: The Challenge and Choices of Interpreting the Prophet's Legacy. Oneworld Publications. p. 12. ISBN 978-1-78074-420-9. ^ Avicenna Latinus. 1992. Liber Primus Naturalium: Tractatus Primus, De Causis et Principiis Naturalium. Leiden (The Netherlands): E.J. Brill. ^ Axel Lange and Gerd B. Müller. Polydactyly in Development, Inheritance, and Evolution. The Quarterly Review of Biology Vol. 92, No. 1, Mar. 2017, pp. 1–38. doi:10.1086/690841. ^ McGinnis, Jon (July 2003). "Scientific Methodologies in Medieval Islam". Journal of the History of Philosophy. 41 (3): 307–327. doi:10.1353/hph.2003.0033. ^ Peter Øhrstrøm; Per Hasle (1995). Temporal Logic: From Ancient Ideas to Artificial Intelligence. Springer. p. 72. ^ Street, Tony (2005-01-01). "Logic". In Peter Adamson & Richard C. Taylor (eds.). The Cambridge Companion to Arabic Philosophy. Cambridge University Press. pp. 247–265. ISBN 978-0-521-52069-0. ^ Fernando Espinoza (2005). "An analysis of the historical development of ideas about motion and its implications for teaching", Physics Education 40 (2), p. 141. ^ A. Sayili (1987), "Ibn Sīnā and Buridan on the Motion of the Projectile", Annals of the New York Academy of Sciences 500 (1), pp. 477–482: "It was a permanent force whose effect got dissipated only as a result of external agents such as air resistance. He is apparently the first to conceive such a permanent type of impressed virtue for non-natural motion." ^ Jack Zupko, "John Buridan" in Stanford Encyclopedia of Philosophy, 2014 (fn. 48) "We do not know precisely where Buridan got the idea of impetus, but a less sophisticated notion of impressed forced can be found in Avicenna's doctrine of mayl (inclination). In this he was possibly influenced by Philoponus, who was developing the Stoic notion of hormé (impulse). For discussion, see Zupko (1997) ['What Is the Science of the Soul? A Case Study in the Evolution of Late Medieval Natural Philosophy,' Synthese, 110(2): 297–334]." ^ George Sarton, Introduction to the History of Science, Vol. 1, p. 710. ^ Carl Benjamin Boyer (1954). "Robert Grosseteste on the Rainbow", Osiris 11, pp. 247–258 . ^ Gutman, Oliver (1997). "On the Fringes of the Corpus Aristotelicum: the Pseudo-Avicenna Liber Celi Et Mundi". Early Science and Medicine. 2 (2): 109–128. doi:10.1163/157338297X00087. ^ Avicenna (1952). F. Rahman (ed.). Avicenna's Psychology. An English translation of Kitāb al-Najāt, Book II, Chapter VI, with Historico-Philosophical Notes and Textual Improvements on the Cairo edition. London: Oxford University Press, Geoffrey Cumberlege. p. 41. ^ Avicenna (1952). F. Rahman (ed.). Avicenna's Psychology. An English translation of Kitāb al-Najāt, Book II, Chapter VI, with Historico-Philosophical Notes and Textual Improvements on the Cairo edition. London: Oxford University Press, Geoffrey Cumberlege. pp. 68–69. ^ George Saliba (1994), A History of Arabic Astronomy: Planetary Theories During the Golden Age of Islam, pp. 60, 67–69. New York University Press, ISBN 0-8147-8023-7. ^ Saliba, George (2011). "Avicenna". Encyclopædia Iranica, Online Edition. ^ a b c Sally P. Ragep (2007). Thomas Hockey (ed.). Ibn Sīnā: Abū ʿAlī al‐Ḥusayn ibn ʿAbdallāh ibn Sīnā. The Biographical Encyclopedia of Astronomers. Springer Science+Business Media. pp. 570–572. ^ Ariew, Roger (March 1987). "The phases of venus before 1610". Studies in History and Philosophy of Science Part A. 18 (1): 81–92. doi:10.1016/0039-3681(87)90012-4. ^ Goldstein, Bernard R. (1969). "Some Medieval Reports of Venus and Mercury Transits". Centaurus. 14 (1): 49–59. Bibcode:1969Cent...14...49G. doi:10.1111/j.1600-0498.1969.tb00135.x. ^ Goldstein, Bernard R. (March 1972). "Theory and Observation in Medieval Astronomy". Isis. 63 (1): 39–47 . doi:10.1086/350839. ^ Marlene Ericksen (2000). Healing with Aromatherapy, p. 9. McGraw-Hill Professional. ISBN 0-658-00382-8. ^ Ghulam Moinuddin Chishti (1991). The Traditional Healer's Handbook: A Classic Guide to the Medicine of Avicenna. p. 239. ISBN 978-0-89281-438-1. ^ Robert Briffault (1938). The Making of Humanity, p. 196–197. ^ a b c Georges C. Anawati (1996), "Arabic alchemy", in Roshdi Rashed, ed., Encyclopedia of the History of Arabic Science, Vol. 3, pp. 853–885 . Routledge, London and New York. ^ Gabrieli, F. (1950). Avicenna's Millenary. East and West, 1(2), 87–92. ^ George Sarton, Introduction to the History of Science. ^ Musallam, B. (2011). "Avicenna Medicine and Biology". Encyclopædia Iranica. Retrieved 2011-11-09. ^ Weisser, U. (2011). "Avicenna The influence of Avicenna on medical studies in the West". Encyclopædia Iranica. Retrieved 2011-11-09. ^ 1 (28 March 2014). "Home Page". amch.edu.pk. Archived from the original on 8 November 2013. ^ Fredrick Kennard. Thought Experiments: Popular Thought Experiments in Philosophy, Physics, Ethics, Computer Science & Mathematics. Lulu.com. pp. 114–. ISBN 978-1-329-00342-2. ^ "UNESCO: The Avicenna Prize for Ethics in Science". ^ "Educating health professionals: the Avicenna project" The Lancet, March 2008. Volume 371 pp. 966–967. ^ UNIS. "Monument to Be Inaugurated at the Vienna International Centre, 'Scholars Pavilion' donated to International Organizations in Vienna by Iran". unvienna.org. ^ "Permanent mission of the Islamic Republic of Iran to the United Nations office – Vienna". mfa.ir. ^ Mir Masood Hosseini. "Negareh: Persian Scholars Pavilion at United Nations Vienna, Austria". parseed.ir. Archived from the original on 2016-03-19. ^ "Youth of Genius" (USSR, Uzbekfilm and Tajikfilm, 1982): 1984 – State Prize of the USSR (Elyer Ishmuhamedov); 1983 – VKF (All-Union Film Festival) Grand Prize (Elyer Ishmuhamedov); 1983 – VKF (All-Union Film Festival) Award for Best Cinematography (Tatiana Loginov). See annotation on kino-teatr.ru. ^ a b c d e f g "Ibn Sina Abu 'Ali Al-Husayn". Muslimphilosophy.com. Archived from the original on 2 January 2010. Retrieved 2010-01-19. ^ "The Canon of Medicine". Wdl.org. 1 January 1597. ^ "The Canon of Medicine". World Digital Library. 1597. Retrieved 2014-03-01. ^ "Flowers of Avicenna". Wdl.org. 1 January 1508. ^ "Flowers of Avicenna – Flores Avicenne". World Digital Library. Retrieved 2014-03-01. ^ ""The Book of Simple Medicine and Plants" from "The Canon of Medicine"". Wdl.org. 1 January 1900. ^ Avicenna. "The Canon of Medicine". World Digital Library. Retrieved 2014-03-01. ^ Nahyan A. G. Fancy (2006), "Pulmonary Transit and Bodily Resurrection: The Interaction of Medicine, Philosophy and Religion in the Works of Ibn al-Nafīs (d. 1288)", pp. 95–102, Electronic Theses and Dissertations, University of Notre Dame. ^ Avicenna, Danish Nama-i 'Alai. trans. Parviz Morewedge as The Metaphysics of Avicenna (New York: Columbia University Press), 1977. Syed Iqbal, Zaheer (2010). An Educational Encyclopedia of Islam (2nd ed.). Bangalore: Iqra Publishers. p. 1280. ISBN 978-603-90004-4-0. Flannery, Michael. "Avicenna". Encyclopædia Britannica. Goichon, A.-M. (1999). "Ibn Sina, Abu 'Ali al-Husayn b. 'Abd Allah b. Sina, known in the West as Avicenna". Encyclopedia of Islam. Brill Publishers. Mahdi, M.; Gutas, D; Abed, Sh.B. ; Marmura, M.E. ; Rahman, F.; Saliba, G.; Wright, O.; Musallam, B.; Achena, M.; Van Riet,, S.; Weisser, U. (1987). "Avicenna". Encyclopædia Iranica. Herbermann, Charles, ed. (1913). "Avicenna" . Catholic Encyclopedia. New York: Robert Appleton Company. O'Connor, John J.; Robertson, Edmund F., "Abu Ali al-Husain ibn Abdallah ibn Sina (Avicenna)", MacTutor History of Mathematics archive, University of St Andrews . For a current list of his works see A. Bertolacci (2006) and D. Gutas (2014) in the section "Philosophy". Avicenna (2005). The Metaphysics of The Healing. A parallel English-Arabic text translation. Michael E. Marmura (trans.) (1 ed.). Brigham Young University. ISBN 978-0-934893-77-0. Avicenna (1999). The Canon of Medicine (al-Qānūn fī'l-ṭibb), vol. 1. Laleh Bakhtiar (ed. ), Oskar Cameron Gruner (trans. ), Mazhar H. Shah (trans.). Great Books of the Islamic World. ISBN 978-1-871031-67-6. Avicenne: Réfutation de l'astrologie. Edition et traduction du texte arabe, introduction, notes et lexique par Yahya Michot. Préface d'Elizabeth Teissier (Beirut-Paris: Albouraq, 2006) ISBN 2-84161-304-6. William E. Gohlam (ed. ), The Life of Ibn Sina. A Critical Edition and Annotated Translation, Albany, State of New York University Press, 1974. For Ibn Sina's life, see Ibn Khallikan's Biographical Dictionary, translated by de Slane (1842); F. Wüstenfeld's Geschichte der arabischen Aerzte und Naturforscher (Göttingen, 1840). Madelung, Wilferd and Toby Mayer (ed. and tr. ), Struggling with the Philosopher: A Refutation of Avicenna's Metaphysics. A New Arabic Edition and English Translation of Shahrastani's Kitab al-Musara'a. Afnan, Soheil M. (1958). Avicenna: His Life and Works. London: G. Allen & Unwin. OCLC 31478971. Goodman, Lenn E. (2006). Avicenna (Updated ed.). Cornell University Press. ISBN 978-0-415-01929-3. Gutas, Dimitri (1987). "Avicenna's maḏhab, with an Appendix on the question of his date of birth". Quaderni Di Studi Arabi. 5–6: 323–336. For a new understanding of his early career, based on a newly discovered text, see also: Michot, Yahya, Ibn Sînâ: Lettre au vizir Abû Sa'd. Editio princeps d'après le manuscrit de Bursa, traduction de l'arabe, introduction, notes et lexique (Beirut-Paris: Albouraq, 2000) ISBN 2-84161-150-7. Strohmaier, Gotthard (2006). Avicenna (in German). C.H. Beck. ISBN 978-3-406-54134-6. Hakim Syed Zillur Rahman. Resalah Judiya of Ibn Sina (First edition 1971), Literary Research Unit, CCRIH, Aligarh Muslim University, Aligarh; (Second edition 1981) Central Council for Research in Unani Medicine, Govt. of India, New Delhi; (Fourth edition 1999), Central Council for Research in Unani Medicine, Govt. of India, New Delhi. Hakim Syed Zillur Rahman (1996). AI-Advia al-Qalbia of Ibn Sina. Publication Division, Aligarh Muslim University, Aligarh. Hakim Syed Zillur Rahman. Ilmul Amraz of Ibn Sina (First edition 1969), Tibbi Academy, Delhi (Second edition 1990), (Third edition 1994), Tibbi Academy, Aligarh. Hakim Syed Zillur Rahman (1986). Qanoon lbn Sina Aur Uskey Shareheen wa Mutarjemeen. Publication Division, Aligarh Muslim University, Aligarh. Hakim Syed Zillur Rahman (2004). Qanun Ibn Sina and its Translation and Commentators (Persian Translation; 203pp). Society for the Appreciation of Cultural Works and Dignitaries, Tehran, Iran. Shaikh al Rais Ibn Sina (Special number) 1958–59, Ed. Hakim Syed Zillur Rahman, Tibbia College Magazine, Aligarh Muslim University, Aligarh, India. Pormann, Peter & Savage-Smith, Emilie. Medieval Islamic Medicine, Washington: Georgetown University Press, 2007. Prioreschi, Plinio. Byzantine and Islamic Medicine, A History of Medicine, Vol. 4, Omaha: Horatius Press, 2001. Amos Bertolacci, The Reception of Aristotle's Metaphysics in Avicenna's Kitab al-Sifa'. A Milestone of Western Metaphysical Thought, Leiden: Brill 2006, (Appendix C contains an Overview of the Main Works by Avicenna on Metaphysics in Chronological Order). Dimitri Gutas, Avicenna and the Aristotelian Tradition: Introduction to Reading Avicenna's Philosophical Works, Leiden, Brill 2014, second revised and expanded edition (first edition: 1988), including an inventory of Avicenna' Authentic Works. Andreas Lammer: The Elements of Avicenna’s Physics. Greek Sources and Arabic Innovations. Scientia graeco-arabica 20. Berlin / Boston: Walter de Gruyter, 2018. Jon McGinnis and David C. Reisman (eds.) Interpreting Avicenna: Science and Philosophy in Medieval Islam: Proceedings of the Second Conference of the Avicenna Study Group, Leiden: Brill, 2004. (in French) Michot, Jean R., La destinée de l'homme selon Avicenne, Louvain: Aedibus Peeters, 1986, ISBN 978-90-6831-071-9. Nader El-Bizri, The Phenomenological Quest between Avicenna and Heidegger, Binghamton, N.Y.: Global Publications SUNY, 2000 (reprinted by SUNY Press in 2014 with a new Preface). Nader El-Bizri, "Avicenna and Essentialism," Review of Metaphysics, Vol. 54 (June 2001), pp. 753–778. Nader El-Bizri, "Avicenna's De Anima between Aristotle and Husserl," in The Passions of the Soul in the Metamorphosis of Becoming, ed. Anna-Teresa Tymieniecka, Dordrecht: Kluwer, 2003, pp. 67–89. Nader El-Bizri, "Being and Necessity: A Phenomenological Investigation of Avicenna's Metaphysics and Cosmology," in Islamic Philosophy and Occidental Phenomenology on the Perennial Issue of Microcosm and Macrocosm, ed. Anna-Teresa Tymieniecka, Dordrecht: Kluwer, 2006, pp. 243–261. Nader El-Bizri, 'Philosophising at the Margins of 'Sh'i Studies': Reflections on Ibn Sīnā's Ontology', in The Study of Sh'i Islam. History, Theology and Law, eds. F. Daftary and G. Miskinzoda (London: I.B. Tauris, 2014), pp. 585–597. Reisman, David C. (ed. ), Before and After Avicenna: Proceedings of the First Conference of the Avicenna Study Group, Leiden: Brill, 2003. Gutas, Dimitri. "Ibn Sina [Avicenna]". In Zalta, Edward N. (ed.). Stanford Encyclopedia of Philosophy. Lizzini, Olga. "Ibn Sina's Metaphysics". In Zalta, Edward N. (ed.). Stanford Encyclopedia of Philosophy. Strobino, Riccardo. "Ibn Sina's Logic". In Zalta, Edward N. (ed.). Stanford Encyclopedia of Philosophy. McGinnis, Jon. "Ibn Sina's Natural Philosophy". In Zalta, Edward N. (ed.). Stanford Encyclopedia of Philosophy. Rizvi, Sajjad H. "Avicenna (Ibn Sina)". Internet Encyclopedia of Philosophy. Chatti, Saloua. "Avicenna (Ibn Sina): Logic". Internet Encyclopedia of Philosophy.